Secluded along the foothills of the Blue Ridge Mountains we have the ideal vacation getaway. This unspoiled paradise is perfect for a romantic rendezvous or a family retreat. With 10+ acres there is plenty of space to soak up the crisp, clean mountain air and enjoy the great outdoors. Walk, hike, or visit the nearby creek. Catch a glimpse of wildlife roaming the area. Play outside on the large front lawn and fire up the BBQ grill for a picnic on the covered patio. At the end of your day, watch the sunset from the porch swing, curl up by the gas fireplace or roast marshmellows around the campfire area. The cabin is located just outside Luray in the heart of the Shenandoah Valley, minutes from Skyline Drive and Luray Caverns. Open year round. 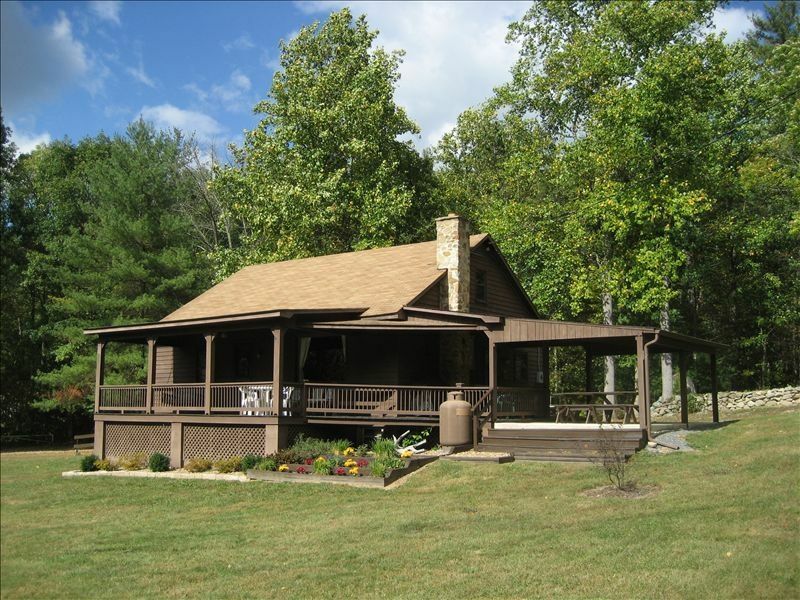 Fox Den Cabin is a family run vacation rental in the heart of the Shenandoah Valley. Our entire family was born and raised in Luray, Virginia. We take pride in providing you with a great vacation experience and a clean, cozy place to call home whenever you visit the Shenandoah Valley. The cabin has a rustic feel, but is just modern enough to provide you with all the amenities of home. The property is bordered by rock walls dating back to the late 1800's. Years of hard work was put into rebuilding the walls as you see them today. Heat pump and electric baseboard heat individually controlled in each room. Picture window looking out into the front yard. Paper towels, bottled water, salt and pepper. Plates, cups, bowls, pots, pans, cooking and eating utensils provided. Large front yard, great for kids and pets! It was close to the park and Luray cavern as well as grocery. Just staying at the cabin was amazing too as it was quite and beautiful. We had a great time. Looking forward to visiting again. Loved most everything. Cozy, warm, lovely lawn/clearing. Fireplace kept cutting out..gas. Directions were great and many things to do close by. Would go back in a heartbeat. Fox Den Cabin was just like the pictures! It’s clearly well kept and loved and had everything we needed. Quiet setting, just a few miles from Shenandoah National Park. We had lots of fun exploring the park, Luray Caverns and enjoy family time by the fire. We would definitely stay here again! The Fox Den was very comfortable and relaxing. We felt right at home staying and despite the weather especially enjoyed the swing on the front porch. The living room furniture was very comfortable with more than adequate seating. The gas fireplace worked very well and warmed up the area quickly. The bedrooms were nicely furnished and the front bedroom bed was very comfortable. We didn’t use the back bedroom so I can’t comment on it’s comfort. The kitchen had adequate utensils and pans along with supplies. Was pleased to see the Keurig coffee maker. The bathroom was well supplied with nice quality towels. Each room had tissues which is a nice added supply. We definitely liked the DISH having all music stations as we listened to XM during most of our stay. There is no internet to connect to XM or Pandora for music so having it through DISH was a plus. There were also many movie channels available although we didn’t take advantage of that. The heating system in the house was very efficient and easy to control and offered air conditioning during warmer weather times. The heat worked quickly and we were always comfortable. We will hope to return someday soon as we really enjoyed our quiet stay. It was just a super short drive into the Shenandoah National Park and was also close enough to town if we wanted to go in for a meal. Glad we found The Fox Den on VRBO! Fox Deb Cabin was perfect for our little family. The location was ideal for quick access to Skyline Drive for hiking! We brought our own firewood but Erik did have plenty there. The house had everything we needed and more! I will be recommending it to friends and family looking to stay close to the park! We were last minute booking the place and the owner was very accommodating. It is very quaint and peaceful. It was clean and comfy. We spent our mornings on the covered porch with our coffee and the evenings with an adult beverage. Loved the sound of nature and the babbling creek was wonderful. Thanks Erik!